← Alien Buddies App Gone Free Again! 1. Search what ever reproducible image, worksheet, document, PDF or picture you want to capture and have it open on your iPad screen (make sure you are complying with copyright laws). 2. 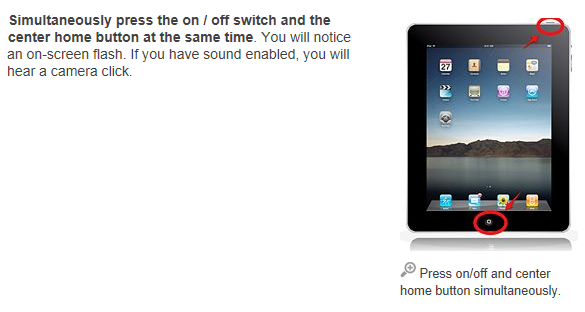 Press the iPad/iPod home (bottom button) at the same time as the power bottom (at the top). You will see a flash and hear a camera click (if your volume is on). Your screenshot has been taken (same thing as Print Screen on your computer). 3. The image will be sent to your Photos for review or use. Import the image into other apps such as Doodle Buddy, Your Whiteboard to draw or write on. Images of reproducible mazes, dot to dots, letter formation sheets, hidden pictures found on the Internet (check out what Your Therapy Source , Education.com/worksheets, All Kids Network, there are many more available ). You may need a stylus for this! Screen shots of documents can be taken and imported and converted into PDF in apps such as Type on PDF Free. Import and crop pictures from Internet sources for use in communication or visual schedule apps such as My Choice Board or First/Then as needed. Take screen shots of images and group them in an Album for a slide show like presentation for your students on your iPad (see Jan. 25th Tip and Trick on creating an Album as a visual schedule or sequence/book. I have taken screen shots of pages of a purchased book bought for my Kindle and viewed on my iPad Kindle app. I took screen shots of specific pages that had sensory checklists and worksheet pages that I use with some of my older kids with sensory issues. In stead of scanning or copying them (this is so much easier), the screen shot takes picture of each page, puts them in my Photo icon/app then I grouped them in an Album by chapter/topic in my iPad for easy retrieval and use with my students. With the right app they can completion checklists by using a writing or drawing tool. Taking another screen shot of the completed checklist will save a copy to your Photos. What did we do before we had iPads? Carried around folders and binders (I still do that, but am trying to decrease my load!) to access the forms and materials we needed. Although we still need manipulative tools and activities with our students, the iPad/iPod can help reduce some of the materials we have to tranport given that many OT’s in schools are transient. Hope that spurs some ideas on how to use your iPad other than with app content. Please share any ways or tricks you have found on how you use screen shots or any other iPad/iPod tricks or tips you have! More for your OT iTools Kit! This entry was posted in Activity Worksheets on Your iPad, iOS, iPad, iPad Management, iPod, Occupational Therapy, Special education, Stylus and tagged iPad, iPad apps, iPhone, iPod, occupational therapy, OT Apps, special education, Tips and Tricks. Bookmark the permalink. Thanks Carol – fantastic, I especially like the idea of using checklists on ipad to complete in time and then screen shot results. I am hoping to decrease my folders and binders as well, but I am a novice, a very willing one though to learn and apply this tool in my practice. Thank you so much again !! You are welcome Fiona, good luck! You may find yourself using different apps, a to do check list and a note taking system. I think I mentioned I use Awesome Note but I also like using Toodledo as a checklist. When you are looking for an app for clinical notes on students check to make sure the app will back up the notes/sync to or you can email the info to another account for retrieval to your computer or someother cyberspace. Awesome not is sent to my Google docs account so that if something happened to my devices or permanent records I would have the notes. I am sure there are many other apps that would work it is just what I had! I would love to hear what you found you used if you have a chance.